Before patch 4.0.3, alliance characters could obtain this pet from the quest Becoming a Parent. 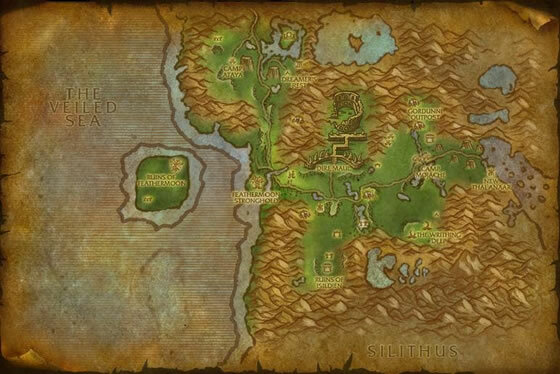 Now the pet may only be farmed by both factions as a zone drop in Feralas. I found mine in Feralas while murdering Noxious Whelps. I was looking for an Emerald Whelpling when this dropped insted! Imagine my surprise and delight! especially since I didn't even know they dropped in the aria. Sprite Darter was on a later to do list. ...I also got my Whelpling. YIPPEE! 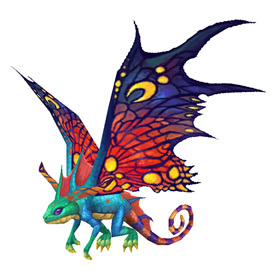 Battlewise, the Sprite Darter Hatchling is identical to a S/S version of a Nether Faerie Dragon (which is much easier to get). That won't help your collection, but it will help you in battle until you obtain the elusive Sprite Darter Hatchling. Spent several hours farming this pet yesterday and nothing. I got three Emerald Whelplings and a few World Drops though >.> <.< can I be lucky in a better more constructive way?! Haha. I'm going back today and hoping it goes better. I got this pet many years ago when it was a quest reward. I sold it for 5k not knowing that it had become a world drop. I was not a happy camper to say the least when I found out. I reacquired her Sunday night - 6/11/17 - from a wandering forest walker after about 20 kills. Very lucky!! Wonderful appearance and animations, and one of my top choices for battle. Perfect pet to take out the first two pets on Veshaar, for instance. You can evanesce out of the first root crush (and at least one round of normal attacks) on Veshaar's second pet, and with "normal" RNG, die just in time to bring in a leveler for the third pet. Or, as Ashlei says, the sprite darter hatchling is sleeping after that accomplishment. So much fun. How come this isn't in the top 20 best looking pets? 7538 kills...and now the proud owner of Sprite Darter Hatchling. Woot!!!! Just found this for 1K. So glad to avoid this grind as I am MONTHS in on the grind for Black Tabby and not wanting to start another! I thought after buying a few expensive pets form AH after giving up farming for them i would slug it out & farm for the Emerald Whelping. After 29miins & 240 kills this Egg dropped. Awesome !! Very Happy. Carried on for 1hr total & 477 kills , still no whelping though. The NFD has always been a go-to for me and now that I have this dude, I'm feeling pretty awesome! I use life exchange quite a bit when fighting the beasts of fable. I am excited to take on the Celestial Tournament armed with an extra pet with this capability! I had the luckiest day - two emerald whelplings (roughly seven hours apart - I got my first after 30 minutes and then quested in the zone for the rest of the time) and one of these beauties after about an hour or so of farming the Noxious Whelplings! The entire reason I stayed in the zone was because I was hoping for this drop. I'm so glad I didn't give up. I highly recommend farming this while you're questing. Stick with it, people, you can do it! I have had this pet for years! This used to be a final reward for a quest chain that started in Feralas if I am not mistaken. I had been collecting pets on my Warlock, but now all pets are for all toons. Got this drop while farming for Emerald Whelpling from the Noxious Whelps, super cute! BY FAR my favorite pet. The Sprite Darter has a stunning, unique appearance combined with S/S and a great moveset. Evanescence works wonderfully, as the Darter is faster than most pets and can "disappear" early, effectively blocking two of the opponent's moves. It can also pack quite a punch with moonfire and then a chain of arcane blasts, especially when the dragonkin passive activates! These adorable critters love snuggling with their owners after a long day of brutal, bloody battle.